So what’s been happening this week in April here in Governors Harbour ? Lots of the winter residents are heading out so the place is beginning to quieten down a little ……..
Building wise there is quite a lot going on right here in town. The house that sits between the up-hill and the down-hill opposite the Buccaneer Club is coming on in leaps and bounds. 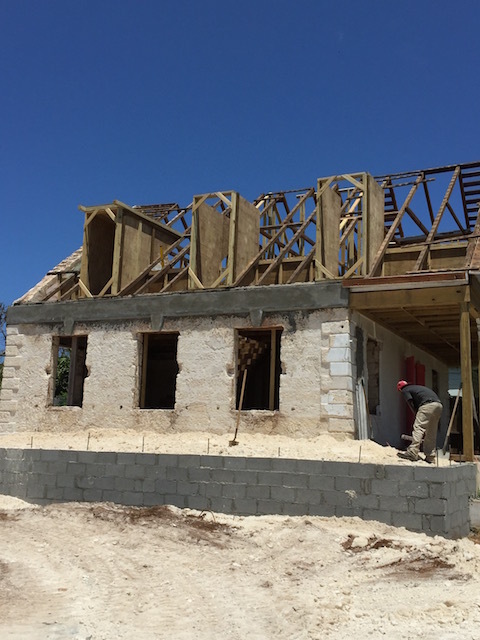 It was stripped right back to the four outside walls only and then reconstructed …. 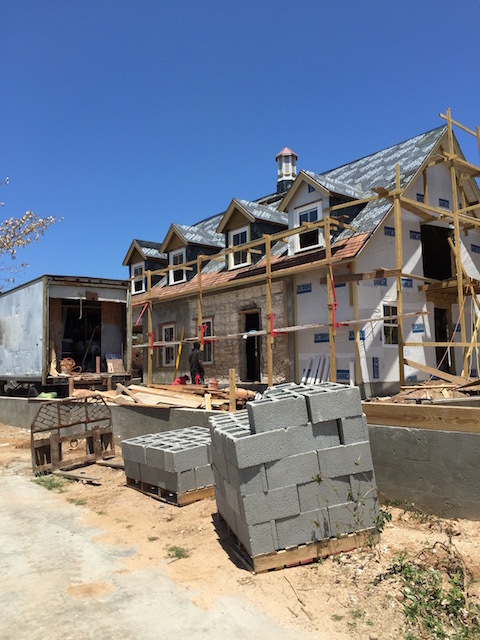 The roof is on and the windows are in – plus on the roof the signature cupola that matches the one on the top of the newly finished Pink Loft – the old liquor store at the bottom of the hill. 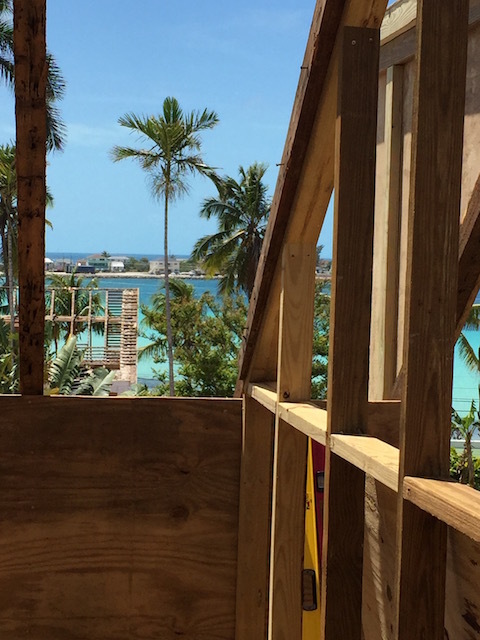 Osprey Building from Nassau are doing the work – and a fine job it is. the Pink Loft – also renovated by Osprey Building is a real credit to the town now and Baby’s House as we call it – will have the same treatment. Plus it has a sweet little swimming pool that you can see at the moment as you come down the down-hill…..
Baby’s House coming on a treat – seen from the down hill side – note the swimming pool in the front..
Baby’s House from the up-hill side- looking very good. Across the road we are working on the restoration of the old Duck Inn Estate. 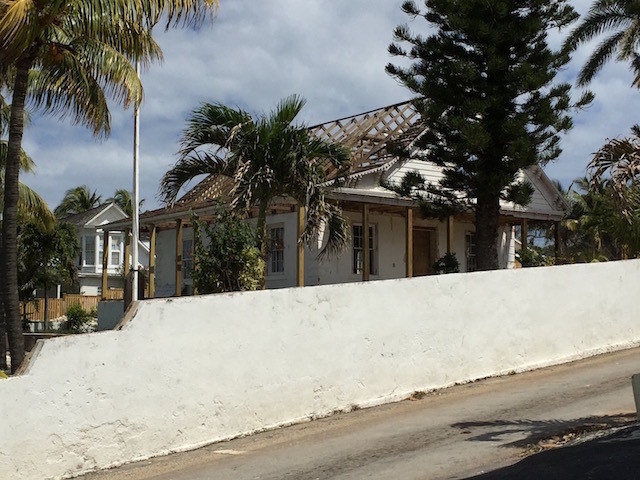 Cornerwall House and Miss Flora’s Cottage have been stripped back as well to the bare basics – all the termite ridden wood removed and they are now ready to be gussied up ! 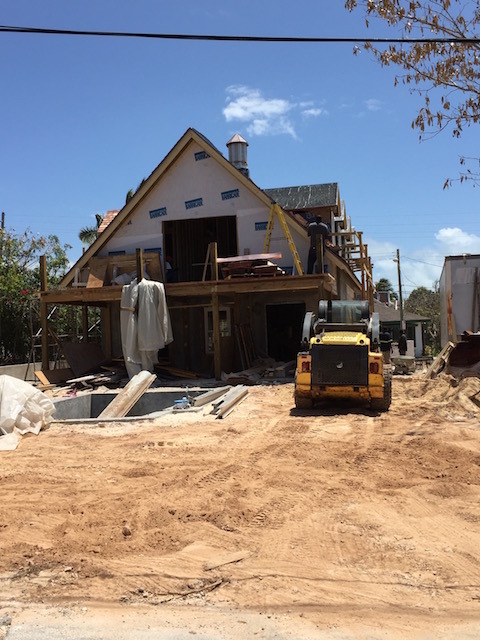 The client we are working for loves Governors Harbour and loves restoring old houses but with all mod-cons – so it is a pleasure to be a part of the process. There will also be a brand new house built on the site as well. All 3 houses will have their own private pool. 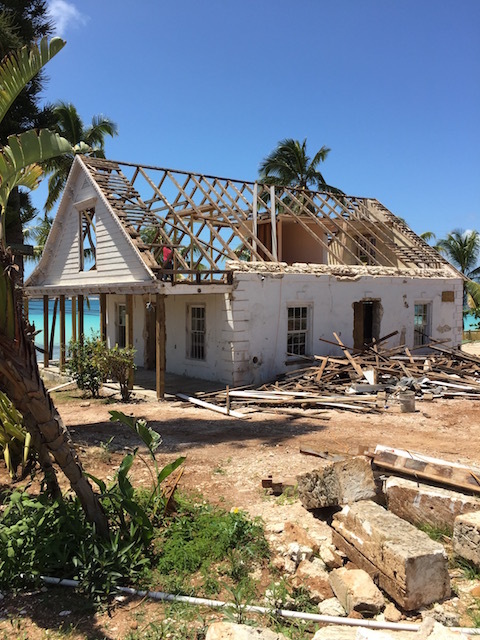 Miss Flora’s Cottage getting the treatment…. Cornerwall House stripped bare ! The views from these 2 houses have been opened up and in the future people using the houses will enjoy beautiful sights of the harbour and it’s coming and goings ….. Like the sea plane that landed here the other day . 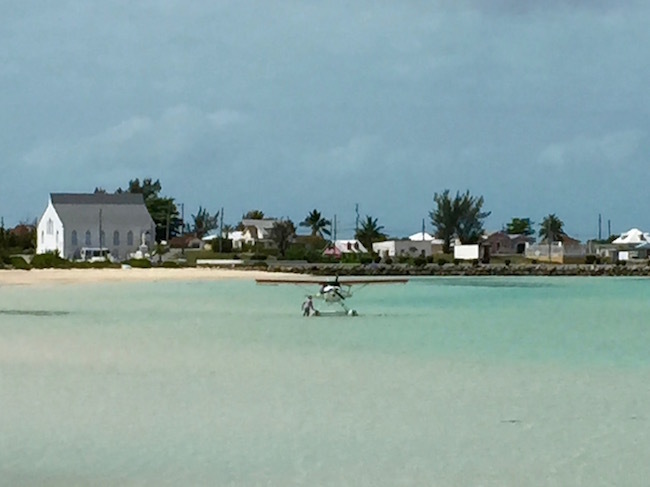 A sea-plane that just popped by the other day…. 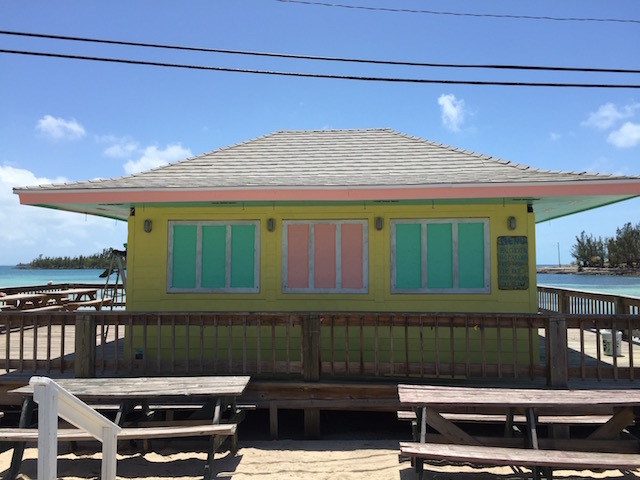 Round at Anchor Bay the Fish Fry Building is having a face lift – painted in pink, yellow and aqua green it is looking very pretty – a real landmark that visitors won’t miss….. 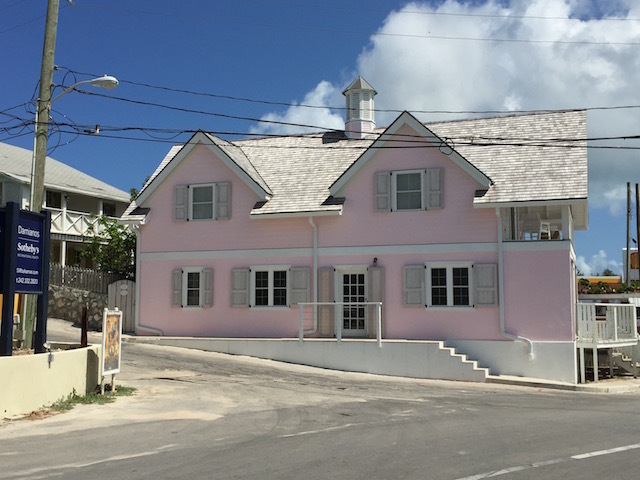 The Fish Fry building at Anchor bay – all gussied up ! Cornerwall House with all the fences down. Wonderful, interesting article Kathy! Looking forward to seeing the finished products! Hope you and Bob are both healthy again! The ground floor of baby’s house is handsome inside. Did the plans for an art gallery there go away? The Pink Loft downstairs is not used at the moment – but Tom Whitehead’s daughter – who is a great artist – may do pop up galleries there…. I should of called it Osprey building not baby’s. Thank you. It is really nice to see what is happening while we are in Canada. Our little corner in GH is quickly becoming quite swish. We need work for local people. Hopefully as these developments continue that will happen. Just can’t help myself !!! !